And we were not wrong as 7250 dominated this index for that week, until Friday 29th when it managed to hold on for that all important close above it, at 7279.17. The trouble is that when we last commented on the FTSE, an entire 10 trading days ago, the ratio landscape has transformed. There is absolutely no point in guessing when, so we are just going to fast-forward to the end of the next week, Friday the 5th April, when the close was 7446.87. More importantly, the intraday high was 7461.39, so we strongly suspect that was this index’s first pop at R3. However, we would be remiss not to point out how huge the changes have been, and in fact, so much so, they have virtually flipped 180 degrees from the 25th March. Although there is now Y2 above the zone, what was there back on the 25th is now below the zone, which itself has leapt 200-points to 7150-7250. But, the real clincher, is B1 has gone from above the old zone to now being below it, which signifies that the entire ratio alignment has totally adjusted. No wonder it has managed to eventually achieve what it was threatening to in that very first week. We would fully anticipate 7450 to slip to R2, leaving 7500 as the next resistance level. If this is the case then the trading range should be 7400 to 7500. Then, it will be all down to the rate of change in the ratios, especially as the clock is ticking and the expiry is now fast appearing on the horizon. Well when we made our trading range just 7400 to 7450, we thought the ratios would change sooner rather than later but it held out all week. This made last week one of the quietest this year, with the net move on the week of just minus 14-points. 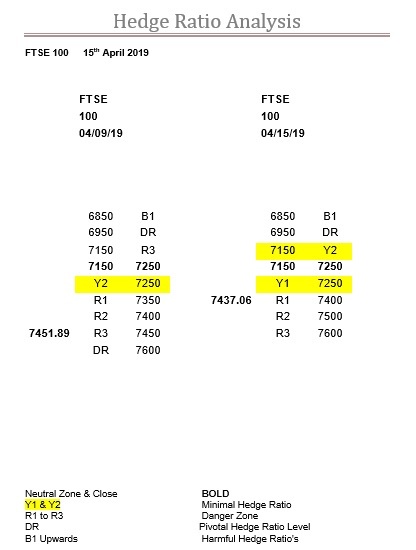 Despite 7450 getting battered all week it held, but as you can see R3 has now slipped to 7600, and our trading range is indeed now 7400 to 7500 just as anticipated. However, the market is now out of time as we enter the rollover and expiry, which this week is on the very unusual Thursday. This means 7400 is the really critical level, as below it is now all just Y1. The good news is, as the ratios have fallen so far, that the zone is very likely to move up again. But, even so, the market is still way ahead of where the zone may end up, so it’s going to be an interesting week for sure.